If you really want to mess with their heads, blind-fold them and let them eat a spoon full of this. They won't even care about the broccoli; all they'll care about is getting seconds (and thirds)! Or at least that's how it was in our house. BandMan, VegKid, and I obliterated this dish. There were leftovers, but only because we literally had to force ourselves to stop eating (we ate the remaining leftovers for lunch the next day). I totally recommend you give this lil casserole a spin around the block. You won't regret it. Even if you hate broccoli. This would be the perfect dish to make for the upcoming holiday family get togethers. First make the "Cheezy-Creamy" part: throw the non-dairy milk, vegan butter, tamari, tahini, lemon juice, nutritional yeast, cashews, cornstarch, mustard, and garlic in a blender, and do the dang thing until it's smooth as a baby's bottom. 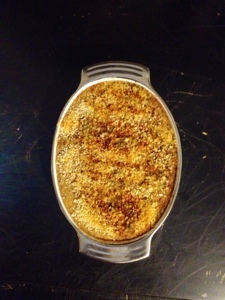 Next make the "Broccoli Casserole" part: Preheat the oven to 400 degrees F. Cook quinoa according to package directions. Saute the onions until they start to brown. Then add in the broccoli and mushrooms. Saute until they are tender and browning. 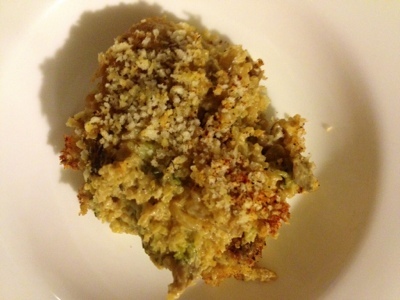 Marry the quinoa and the broccoli/mushroom mixture. Now, pour the "Cheezy-Creamy" all over it and mix it up. Relocate this goopy pile in to an oiled casserole dish. Top with panko and sprinkle with a drizzle of oil, salt, cayenne, and pepper. Cover tightly and bake for 20. After her 20 minutes of sizzling fame is up, remove the foil and let her brown under the broiler for a minute or two. 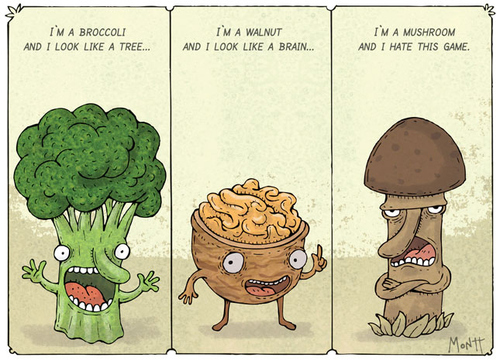 Poor mushroom. I still love you. Also, this look delicious! Definitely adding it to my post-mofo to-do list! Yes! Tell me all about it after you've given her a try, Kelly!